STATE THEATRE ANN ARBOR photo art print picture for sale. ANN ARBOR STATE THEATRE photo picture art print photograph for sale. STATE THEATRE Ann Arbor print photo art photography for sale. This is a very colorful artistic portrait of the Ann Arbor State Theatre in downtown Ann Arbor located on State St. at the corner of Liberty St. This original copyrighted photo has been created by regional artist/photographer Mr. Jan Kaulins. 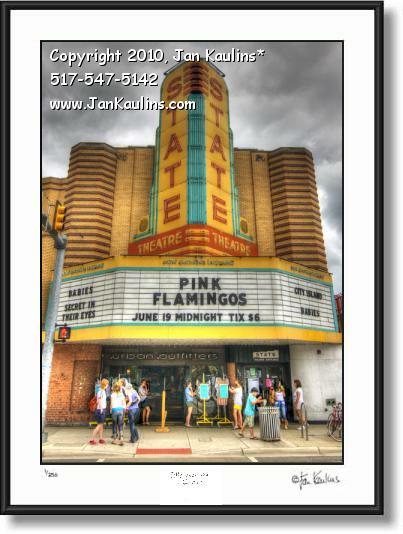 The title to use for ordering this Ann Arbor State Theatre photo art print is: STATE THEATRE HDR.